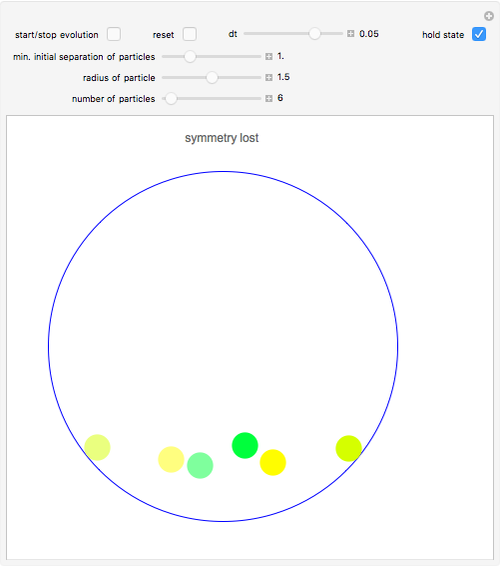 We consider a system of identical, perfectly elastic but otherwise noninteracting particles that are disks in a rigid circular container under the downward influence of gravity. Initially the particles are at rest and placed with mirror symmetry. From the equations of motion of the system, we conclude that the exact particle trajectories would remain mirror-symmetric forever. 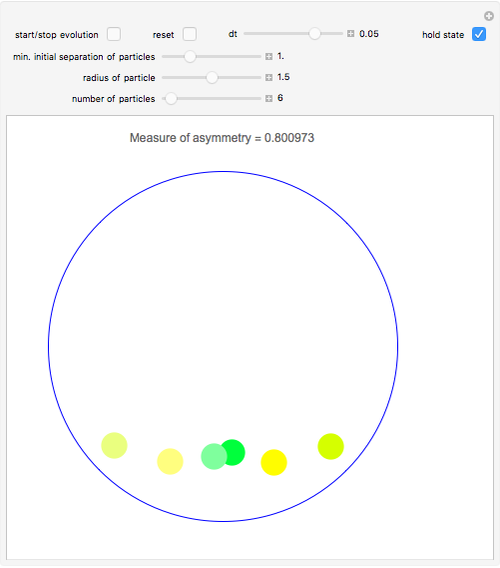 This Demonstration shows that accumulating numerical errors break the mirror symmetry rather quickly. The more particles in the container, the sooner the breakdown of symmetry becomes evident. Control labels and graphics provide explanations in the form of tool tips, which appear while hovering over them. Snapshot 1: This is the initial state. The particles are at rest. Due to gravity they will fall downwards. This is also the case if "dt" is given a negative value! 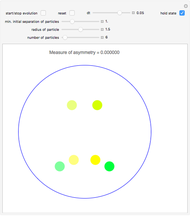 For each of the three particles in the right half of the container there is a mirror-image twin, shown in a corresponding color of lower saturation. Snapshot 2: After many reflections of particles with the container wall and with other particles, the arrangement of particles and their mirror twins is no longer strictly symmetric. 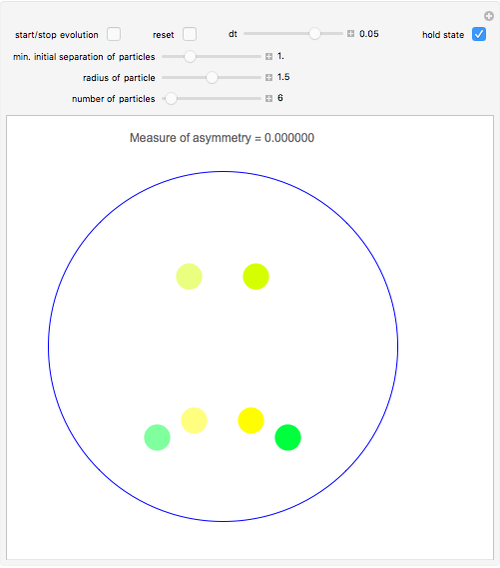 Snapshot 3: Even less symmetric now! Snapshot 4: Further reflections and collisions destroy the symmetry completely. The destruction of mirror symmetry by numerical inaccuracies was studied for more complex particles in three dimensions in the following references. U. Mutze. "Precision-Dependent Symmetry Breaking in Simulated Motion of Polyspherical Grains." (Jul 7, 2009) www.ma.utexas.edu/mp_arc/c/09/09-113.pdf. U. Mutze. 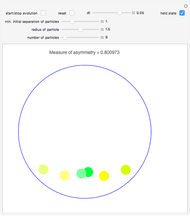 "Comparing Motion of Polyspherical Particles Computed with High and with Low Numerical Precision, UM 2009-03-03." (Mar 3, 2009) www.ulrichmutze.de/symmetry_lost_movie/symmetry_lost.html. Ulrich Mutze "Time Evolution of a Symmetric System"